In news so far-fetched a network executive actually made a joke about it back in 2015, '80s family hit ALF is set for a reboot. Warner Bros. is developing a new series of the show, with original writers Tom Patchett and Paul Fusco attached. ALF ran for four seasons from 1986 to 1990 on NBC, and there were whopping 102 episodes of the sitcom broadcast during that time. It told the story of a "friendly extra-terrestrial", who crash-landed on Earth, and wound up living with a suburban middle class family. 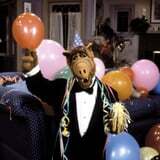 ALF (an acronym for Alien Life Form) was a puppet performed and voiced by Fusco. With Fusco on board, it seems like ALF himself will be similar to the '80s original, though he'll live with a new family in this modern reworking. The Hollywood Reporter describes the reboot as being "in very early development", with no network attached yet. But with the current obsession with rebooting and reworking nostalgic classics, it seems likely we may see every '80s kid's favorite alien back on our screens soon.